Attention Montreal: I'll be in Montreal, Quebec, Canada, next Monday (September 5) and we're having a gathering near Notre Dame for readers of Ask Leo!, and HeroicStories, as well as Randy Cassingham's This is True readers. We don't have the exact time on Monday or the exact location, but if you're nearby and can come, drop me a line with the subject Montreal (just reply to this newsletter and change the subject line) and I'll let you know the details when they firm up. I have another trip planned at the end of the month with an even more exotic location. No idea if I'll be able to pull off a reader gathering there, but I'll get you more details as plans firm up. Charging an Annual Subscription for Windows? Nope. 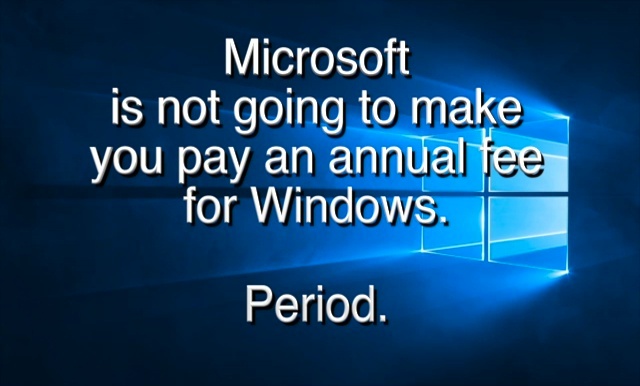 There's a persistent and bogus rumor that Microsoft is planning on charging a monthly or annual subscription fee for Windows. I discuss why it's bogus, and the folks that continue to persist pushing the rumor are, at best, Microsoft haters, and at worst... trolls. Continue Reading: Charging an Annual Subscription for Windows? Nope. What's the Difference Between an App and Application? In one of the more frustrating recent turns of terminology, the term "app", which one might think is shorthand for "application", now more commonly refers to something quite specific and quite different. The adoption of the app/application difference in Windows started in Windows 8, and is carried forward in Windows 10 with a vengeance. It's driving people who are trying to explain things – you know, people like me – absolutely nuts. And, particularly when it comes to Windows 10, the distinction turns out to matter. Continue Reading: What's the Difference Between an App and Application? Why is My Backup Program Saying There's Not Enough Space on System Reserved Partitions? System Reserved partitions 60% full and this is preventing my backup program from running. What should I do? Honestly, I'd have to see the exact error message to be sure, but there is one thing about this scenario that concerns me. The amount of free space in a system reserved partition should have nothing to do with your ability to back up. Continue Reading: Why is My Backup Program Saying There's Not Enough Space on System Reserved Partitions? How Do I Encrypt a File? How Do I Encrypt a Folder? How Do I Encrypt a Disk? Questions recently posted at The Ask Leo! Forum. If you see "Answer Needed! ", maybe you can help! Missing USB drivers render computer useless? More: All forum questions in need of an answer. Would file encryption work to thwart Ransomware? How about encryption on a Mac or Linux? No. If you use file encryption, that would only mean that your encrypted files would be encrypted a second time by the ransomware. "Would file encryption work to thwart Ransomware?" - No. Not at all. Actually it's not quite that black and white. Or, as my most common answer goes, "it depends". IF your encryption technique involves renaming the file - for example renaming "important.docx" to "important.docx.axx", and ".axx" is not on the of file types encrypted by the particular ransomware variant encountered, then the file will not be impacted by that ransomware. And yes, this implies that simply renaming a file to a non-targetted extension would also cause that ransomware to bypass it. As you can tell, whole disk encryption, as discussed in this article, doesn't change file names, so Ray's and Mark's answers stand: whole disk encryption has no effect on ransomware. HOWEVER other recently discussed encryption techniques - specifically TrueCrypt/VeraCrypt vaults, individual file encryption and so on - do stand a reasonable chance of bypassing most (though not all) ransomware threats. It's worth noting that ".zip" files are likely to be targeted simply because they're ubiquitous - thus using .zip for some kind of ransomware protection is not particularly useful. In fact, I'll go one step further: relying on your own encryption is not a way to plan for, mitigate, or otherwise "protect yourself from" ransomware. Do all the things you do to protect yourself from all malware - including those all important backups. The topic remains interesting, though, for those folks who have been impacted by ransomware - some of the files on their machine may have dodged a bullet depending on the encryption they may have used, and the specific attack targets of the specific ransomware encountered.